T.J. Dillashaw broke his silence on Friday afternoon. The former UFC bantamweight champion released a video statement on Instagram about his failed drug test and two-year USADA suspension. In the statement, Dillashaw admitted he “messed up,” adding he feels the worst for others impacted by his decision to use a banned substance. “I’m having a hard time trying to forgive myself for this — I should have a hard time,” Dillashaw said. “I understand the criticism and scrutiny coming my way, but what I really feel bad about is me bringing down my coaches, my family, my teammates. They had no involvement in this. Dillashaw tested positive for recombinant human erythropoietin (EPO) on Jan. 18 ahead of a flyweight title fight against Henry Cejudo, which Dillashaw lost via first-round TKO. Dillashaw announced last month USADA had discovered an “adverse finding” in one of his samples and he subsequently relinquished the 135-pound title. USADA announced earlier this week Dillashaw’s positive result was for EPO and suspended him two years. The New York State Athletic Commission (NYSAC) previously suspended him one year. The Cejudo fight took place in Brooklyn on the first card of the ESPN era. Henry Cejudo, the current 125-pound champ, and Marlon Moraes meet for the vacant bantamweight title in the UFC 238 main event in June. 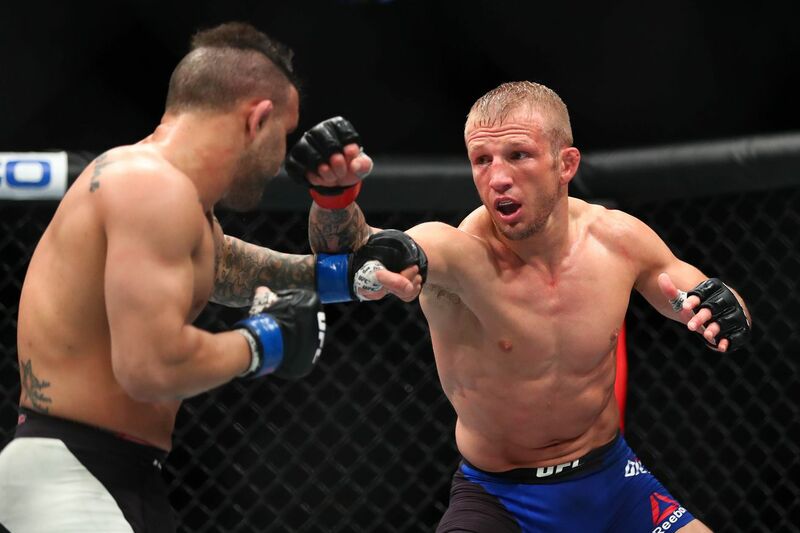 Dillashaw, who is eligible to return to the cage in January 2021, vowed that he will be back better than ever. He also said that he’s had the success he’s had — winning the bantamweight title twice — because of his hard work, not the banned substance he used. Dillashaw added that he had surgery on his right shoulder Thursday and will have surgery on his left shoulder in about two months. He said he has been dealing with a torn rotator cuff and torn labrum for the past two and a half years.